Having a bag full of small (new) potatoes always make me think of dum aloo. I have made dum aloo plenty of times but it is one dish which I constantly like to try a new version. Out of all the versions I have tried so far, I love this one. I am not very active or clued on Twitter all the time but yes it has its uses. I posted on my TL asking chefs to recommend a dum aloo recipe. Talented Mallika Basu of Quick Indian Cooking promptly referred a recipe on her blog of ‘aloor daum – a bengal style dum aloo‘. For me any Bengali cooking is full of poppy seeds & sugar. I was pleasantly surprised to note that this recipe doesn’t call for any of the two. I was sold. I made it and loved it. So when I was hosting a potluck party for V’s friend, decided to throw in a side dish of dum aloo along with my dal makhani. I added steps of soaking the potatoes in salted water for few hours and frying them before adding to the gravy. If you are like V and don’t like to eat potato skins, I recommend using big potatoes, peeling them and cubing them instead of small (new) potatoes. It is really nice with awesome tangy taste due to curd. I absolutely love this recipe. 1. Wash the potatoes clean thoroughly. Prick holes all over the potatoes using a fork. Place them in salted water for 2-3 hours. This allows the salted water to reach the inside of the potatoes and impart flavour. Drain and dry the potatoes using a towel. 2. In a wok heat oil for frying and gently fry all potatoes till golden brown. 3. In a pan, heat 1 tablespoon of oil and add the asafoetida. 4. As it sizzles, add the tomatoes, the ginger and all spices except garam masala. Stir for five minutes until the tomatoes break down and the spices give out a subtle aroma. 5. Add the curd and stir vigorously for another five minutes so it is well incorporated with the spices. It usually avoids the gravy from curdling too. I usually use a whisk here as it makes vigorous mixing easier. 6. Stir in the potatoes, coating the gravy well into them. Add salt. 7. Now add a cup of hot water, cover the pan. Allow the potatoes to cook and the curry to dry up. Stir the gravy well every few minutes to avoid sticking to the bottom and even cooking. 8. Test the doneness by inserting a fork gently into the potatoes. If it passes with little or no resistance, the potatoes are done. Gravy would also be dry by then. 9. Mix in the garam masala and adjust for salt. 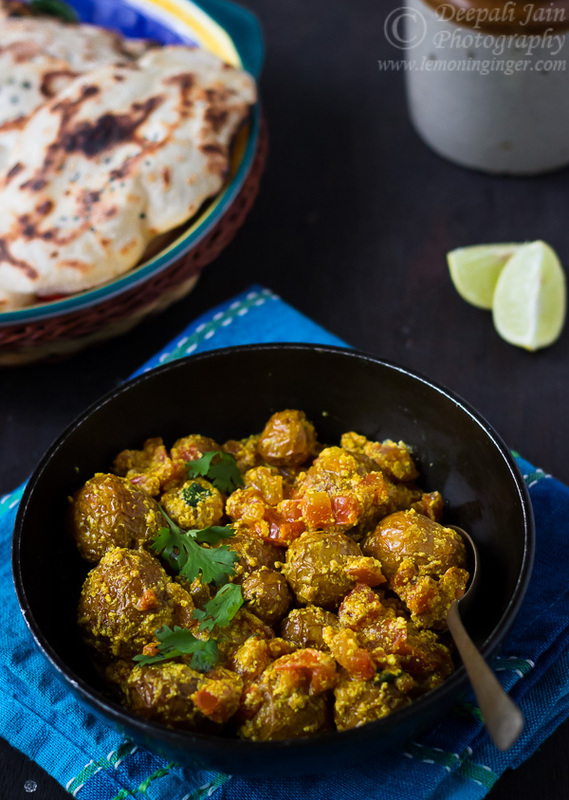 Serve hot with naan or parantha. 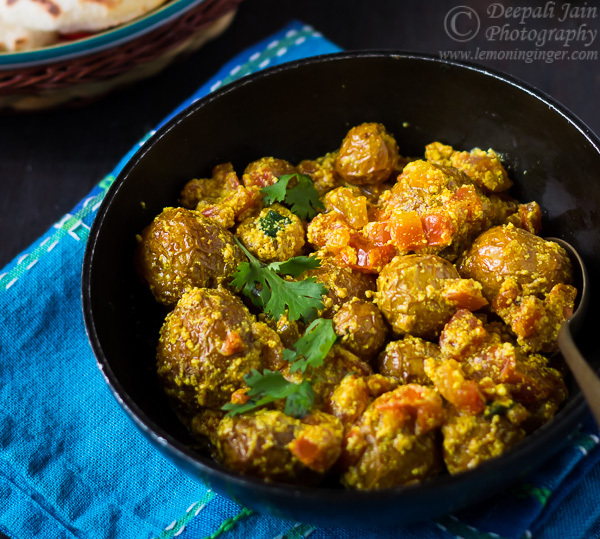 Wonderfully tangy and tasty Bengali style dum aloo.